I'm always looking for new places to shoot, especially when I've worked at a wedding site multiple times. 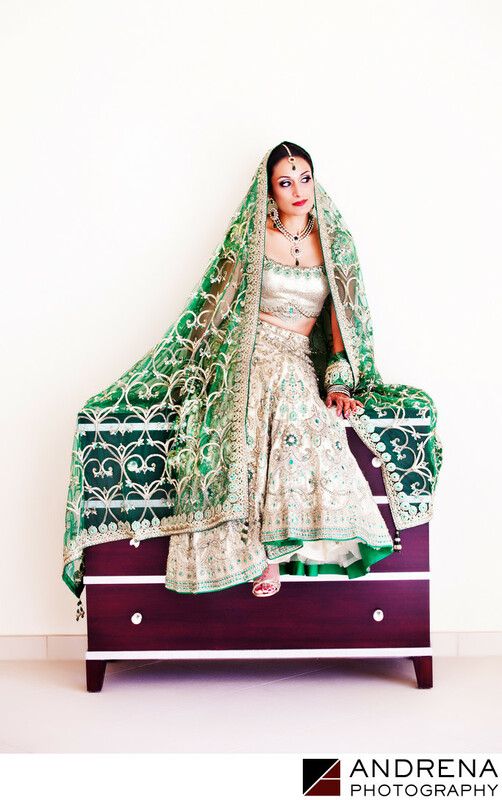 For this Indian wedding, which took place at the Laguna Cliffs Marriott, the bride wore a green lengha, which is very rare. Most Indian brides wear red or a shade close to red (coral, pink, fuchsia, burgundy, orange, etc.). So when I arrived to find that my bride would be wearing green and gold, I was thrilled. Though I photographed her in several different locations on the Laguna Cliffs Marriott property, I ended up liking this image against a simple beige wall the best. It isn't often that a dresser is in just the right light to facilitate a portrait like this, but on this day, the dresser's location was fully cooperative with time of day and direction of light. I always love when a bride is game to jump up on furniture or lay down on the ground. Indian brides are wearing heavy and very ornate outfits that weigh many pounds. One of my brides had a skirt that weighed 15 pounds, so it's not always easy for an Indian bride to be super flexible with her posing. In this case, the dress was flexible enough and the bride was game, so the end result was this simple portrait that her family just loved. Indian wedding photographed at the Laguna Cliffs Marriott, Laguna Beach, California.